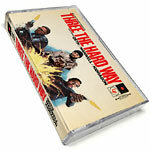 Mellow Orange presents ''Three The Hard Way,'' a limited edition cassette mixtape curated by DJ's QSTN (aka Question), Manwell and Kidragon. Featuring a collection of breaks, beats and grooves tightly strung together for nearly an hour worth of funk! QSTN has garnered the attention of global music sites like OkayPlayer, Giant Step Records, and Noisey by Vice. Kiddragon has toured throughout the US, Canada, and Europe, including an opportunity to tour alongside Slum Village and the late James Yancey (J Dilla) in 2001. Manwell is a 3-time DMC LA region champion (2012, 2014, and 2015) and is now competing for the title of U.S DMC Champion. He has performed all over Europe, Canada, Australia, New Zealand and the U.S.